Recently, I have really been thinking and reflecting on why there is so much confusion in the world and why creations find it more challenging now to live right and imbibe virtues that make for better life and worthy of emulation. There is so much uncertainty and distrust in the world. Individuals are no longer in control of their personal lives and to a greater percentage it seems like things have fallen apart and the center cannot hold anymore. 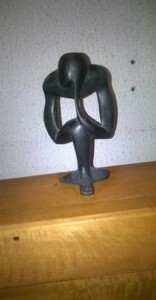 I always remember the art work gift I bought for myself and some friends from Gambia in 2009. It’s called the “Thinking Man.” Growing up we were thought WISDOM – to live wisely. Wisdom as we know is the application of knowledge and knowledge is received and processed information. Thus the quality of information we receive and process is very key to the quality of life we live. Information is either factual or accurate and should not be based on hearsay or other people’s opinion without any iota of truth and relevance. The later is the reason the center has collapsed in so many lives at individual and group levels. This is because the center is often times not built or shaped on facts about the Creator and the purpose for creation. This center I call “ACCURATE THINKING” – the Eleventh (11th) Principle of the 17 principles of Individual Achievement by Napoleon Hill. This Principle is the foundation of all successful achievement. It analyzes the power of the human mind and is one of the profound subjects of Napoleon Hill Philosophy with the key to the secret of all successes and all failures. Accurate Thinking is the mental process that enables us to identify that which is TRUE and RELEVANT. It is more than critical thinking which is just our ability to analyze the agenda and thoughts of others. Accurate Thinking is concerned with creating new agendas, new thoughts and new visions. It is proactive rather than reactive. It is a system that can address problems before they occur. The mind is the greatest of all human assets and is a divine gift. This divine gift seats our thoughts and the power of our thought is the most mysterious and the greatest of all powers available. Every accomplishment in life whether it is good or bad develops first as a thought. Our power of thought can be used destructively or constructively for success and benefit for all mankind. Often times we have heard that misery has many followers. The average man likes sympathy and self-pity while the success minded seeks the way out of a miserable situation. The success minded seeks and processes information that are true and relevant on how to advance and overcome situations that are limiting and does not support success, love for humanity and peace of mind. My hunger and thirst for peace of mind and success led me to discovering Think and Grow Rich in 2003 and undertaking the courses offered by Napoleon Hill Foundation. The experience has been amazing and so much has been achieved using the principles both at home and at work. My twenty six years at work has been marked with many challenges and adversities yet I have overcome all of them by thinking accurately, basing my decisions and actions on what is true and relevant. I am engaged actively with an NGO-Thomas Honeycomb Foundation totally committed to training minds to think accurately and maintain positive mental attitude since 2010 using Napoleon Hill’s Think and Grow Rich and the 17 principles. My experience so far is that very few people you meet in life think accurately. People see and take issues on the surface without researching to get facts and truth about matters they are involved in. I have had running battles with peers and folks when I ask questions like “ARE YOU SURE?,” “CAN YOU SUBSTANTIATE YOUR INFORMATION,” “DO YOU HAVE PROOFS?” Studying and practicing Napoleon Hill’s philosophy for more than a decade has enabled me to distinguish accurate thinking based on facts, truth and relevance from just mere wishful thinking. The resultant effect is that I am at peace with myself and other people around me at any time. I have maintained a winning attitude both at home and at work. My assessment of people or situations is not based on any ones opinion but rather on the facts available. Accurate Thinking has the capacity to make us friendly people, improve our empathy, self-assessment and & social skills. The world and experts should understand that this principle is key to Emotional Intelligence popularly thought in so many corporate organizations seeking better ways to improve relationships, productivity and achieve extra ordinary success. Accurate Thinking is the way to Emotional stability, taking decisions and living a life of legacy. Napoleon Hill said “The Man that the devil fears is the man that thinks.” Dare to be different in a world where many are running the rat race without peace of mind. The opposite of accurate thinking is “stinking thinking” as Art Carney used to say. You don’t belong to this majority because it stinks, negative and limiting. Take control of your thoughts. The Creator gave you absolute control. I have Masterminds both at home and at work and we are solving problems very many thought could never be solved. We spend on what is relevant. We help people save and invest more. We changed from brooding to achieving by thinking accurately. Accurate Thinking is quality thinking and it is effective. It has helped me solve problems piece by piece, proceeding from established facts to the next. It is objective and disciplined. It checks, verifies and insists on specifics answers. When implemented by action (Personal Initiative 6th Principle) and supported by Mastermind Alliance results achievements of greater proportion. Without the support of Accurate Thinking, the Big Four Principles of Individual achievement – Definite Major Purpose, Mastermind Alliance, Going the Extra Mile and Applied Faith would be useless. Accurate Thinkers pray with faith because they have examined the evidence of the existence of a Creator as it is provided by the system and the order of the universe. Thus we see that faith is a state of mind that can be attained by the principle of Accurate Thinking. An Accurate Thinkers first request is for MORE WISDOM and that has been my greatest prayer. Wisdom to discern good from bad, success from failure. In February I received two awards of excellence from two different strategic business units in my organization for leading the team that dared the impossible – achieving 42% reduction in the cost of demurrage in our downstream oil sector. This was achieved with even more than 16% increase in volume of petroleum products and number of marine tankers received in 2016 benchmarked against 2015 transaction. Dare to be different, dare to be an Accurate Thinker. Dare to join the minority that has always been and will always be our hope, the pioneers of all fields of endeavors, the trail blazers of industries, businesses, education, religion, families, statesmanship etc. Accurate Thinking is a priceless asset that cannot be purchased with money nor borrowed from others. It must be self-attained through the strictest habit of Self-discipline. Accurate Thinking is the basis for controlled habits. Above all it is the HIGHEST EXPRESSION OF OUR RESPECT FOR OUR CREATOR. Dare to Escape! Think Now! Think Accurately! Achieve!